Last month at work, we held our annual November luncheon for the tenants. This meal is essentially a Thanksgiving meal with Turkey and most of the trimmings, as well as various potluck dishes provided by the tenants. One of my tenants brought the most beautiful arrangement of sliced fruits. Visually the platter was stunning, but unfortunately with so many choices on the table, little of the fruit was eaten. Due to our conversation difficulties (she speaking Russian while I do not, and my speaking English while she does very little) I was not able to let her know to take her dish home when she left the luncheon. Not wanting to waste the food, I covered it well and stored it in the refrigerator we use to hold sodas. As things happen the next day my own lunch was a bit small and I remembered the fruit plate in the refrigerator. 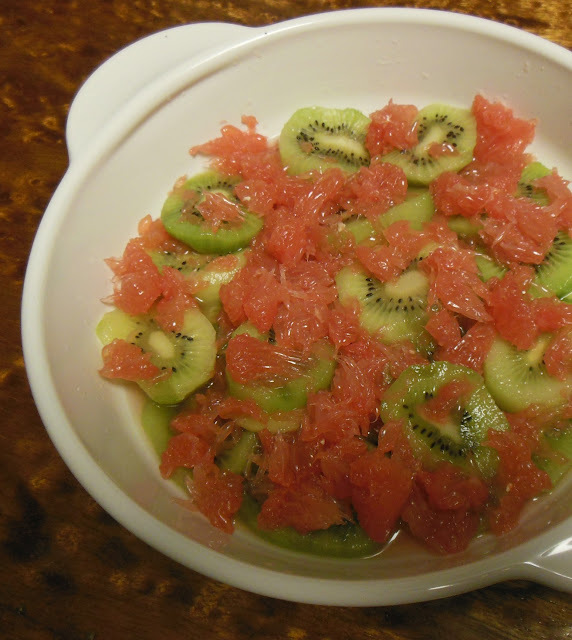 I decided to help myself to the sliced kiwis, and when I was dishing up, I noticed that under the kiwi slices were slices of grapefruit. They had softened in the acid of the grapefruit and taken in just enough of the grapefruit flavor that they were more delicious than anything I could imagine. Sometimes the simplest pleasures are the best. Let me introduce to you, this kiwi and grapefruit combo. While it is not a gorgeous dish in looks, it is in flavor. And that my friends, is the best food to share! Peel and slice the kiwi, placing in a shallow bowl. Cut grapefruit in half, spoon out the sections. You don't have to be careful, you will actually need to break the grapefruit into smallish pieces. 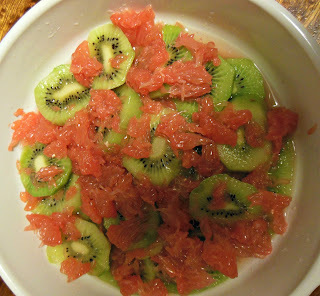 Scatter the grapefruit pieces over the kiwi slices. Squeeze any juices left in grapefruit rinds over the fruit. Cover and chill until serving, at least 2 hours. This was our Thanksgiving viewpoint, we have lots to share! I love how pretty that salad looks. How lovely to connect with your tenants. A serendipitous discovery! For me, grapefruit and kiwi are both iffy. When they're good, they're very very good, but when they're underripened or not sweet, they're pretty bad! I just love this combination, it looks so fresh and perfect for the holidays. Thank you so much for sharing with Full Plate Thursday and have a great day. looks delicious thanks for sharing with Hearth and soul blog hop,pinning.